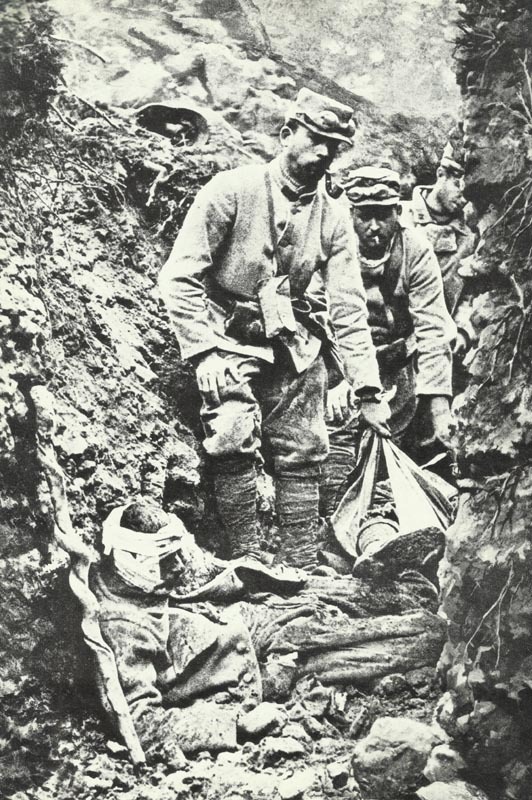 Removal of dead and wounded in a French trench. Memo from Sir J French advocates offensive to recapture Ostend and Zeebrugge (under development as U-boat bases) but plan rejected by January 28 despite his visit in London on January 12-13. Alsace­: French gains near Cernay and at Steinbach. Artois: French gains near Arras. Argonne: ­German attack on Boureuilles. Bukovina: Russians occupy Suczawa, Kimpolung and reach Hungarian frontier on January 6. Serbia: Austrians occupy Ada Tsiganlia island near Belgrade. Armenia: Siberian Cossack Brigade retakes Ardahan with 1,300 PoWs and 4 guns. Turk XI Corps takes and loses Height 808, 4 guns and 300 PoWs to Yudenich. Dense fog stops operations at Sarikamish. Belgium: Cardinal Mercier arrested for pastoral letter about German cruelty. France: Revised contraband list issued. Britain: Day of intercession for victory. Fisher to Churchill: ‘I consider the attack on Turkey holds the field, but only if it’s immediate’.